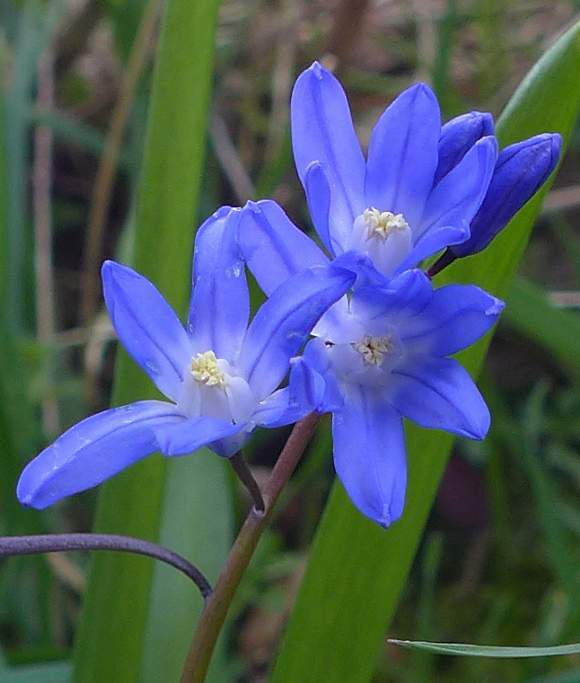 The leaves (of which there are more than 2 as in Alpine Squill) are with the flowers. Flowers branched from a stalk with between 4 and 12 flowers. The tepals (of which there are 6) are fused into a proximal tube at between 1/5th and 1/2 of their length. Flowers branch off at intervals along the stem, which gets thinner each time a petiole peels off. The flowers are on a widening stalk which is longer for the lower flowers and progressively shorter for those near the top. The free part of the tepals are white for the first 1/3rds of their length merging to blue for their final 2/3rds. Their length is between 10-15mm, whereas the sepal tube part is only 3-5mm long. The six stamens are at the summit of white broad flat filaments arranged in an inner circle. 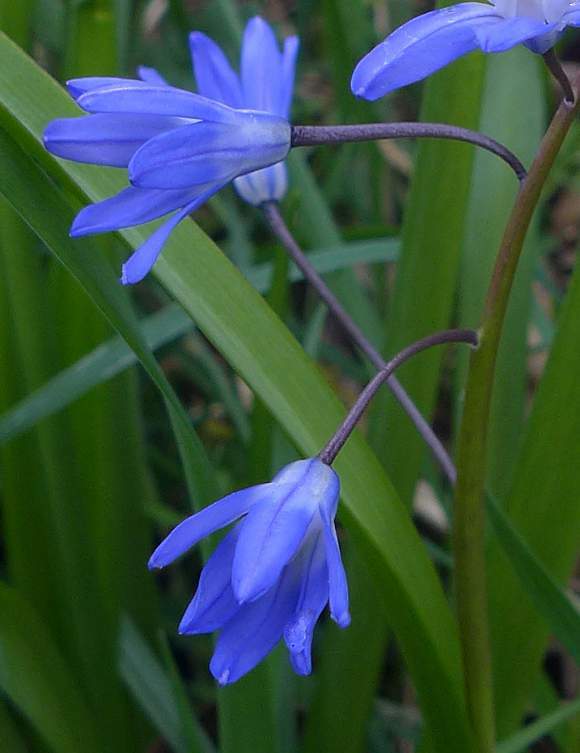 There are several other similar plants in both Scilla proper and in the former Chionodoxa genera that resemble Glory-of-the-Snow to various degrees. The distinction between Glory-of-the-Snows and Squills is that Glory-of-the-Snows have the sexual organs within a short, white proximal tube or corolla in the centre of the flower which protrudes. The filaments converge and the anthers within it barely protrude much. 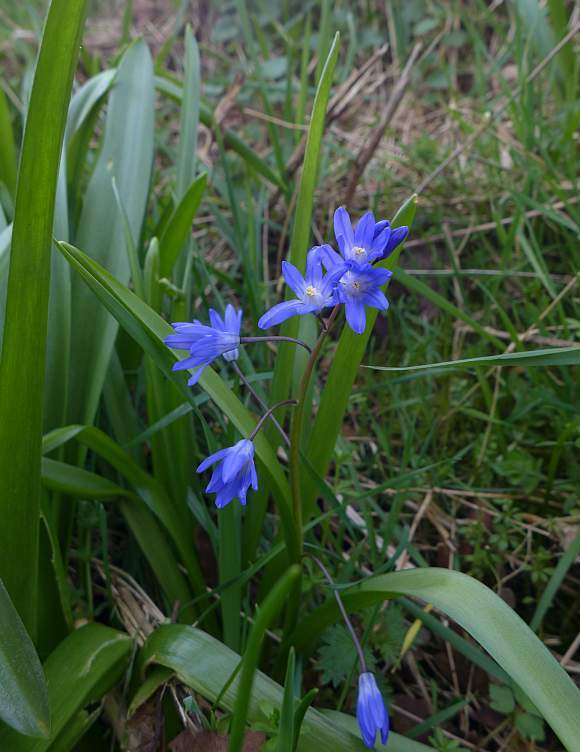 Scillas, on the other hand, have no such central corolla and the filaments splay out. No relation to : Chilean Glory-flower (Eccremocarpus scaber), Common Morning-glory (Ipomoea purpurea), Crimson-Glory-Vine (Vitis coignetiae), Summer Snowflake (Leucojum aestivum), Snowdrop (Galanthus nivalis) or Snowdon Lily (Gagea serotina) [plants with similar names belonging to differing families]. Glory-of-the-Snow is the most common of a series of differing Glory-of-the-Snows which are all introduced and naturalised plants grown in parks and gardens and grassy verges, from where it can spread or escape as garden throw-outs. 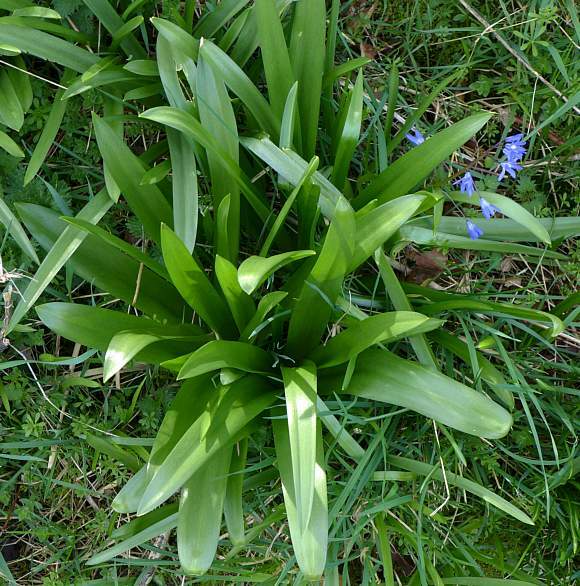 Hybridises with : Alpine Squill (Scilla bifolia) to produce Scilla x allenii (which was formerly called X Chinoscilla allenii until taxonomists realised that the two parents are in the same genus (Scilla) so that particular Inter-Genera Hybrids (which in reality should not happen as a matter of definition) was banished. Glory-of-the-Snow is toxic to livestock and humans containing high quantities of HomoIsoFlavonoids which have anti-bacterial, anti-mutagenic and anti-inflammatory properties. 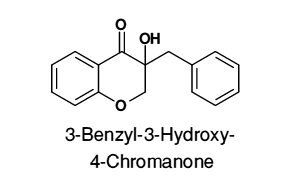 The HomoIsoFlavonoids found in Glory-of-the-Snow are as 3-Benzyl-4-Chromone, 3-Benzyl-3-Hydroxy-4-Chromanone and various variations on those as well as the Scillascillin -type of HomoIsoFlavonoids. 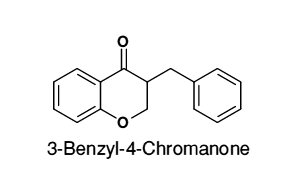 As well as the Homo-Iso-Flavonoids shown here, Glory-of-the-Snow contains several others similar to these. 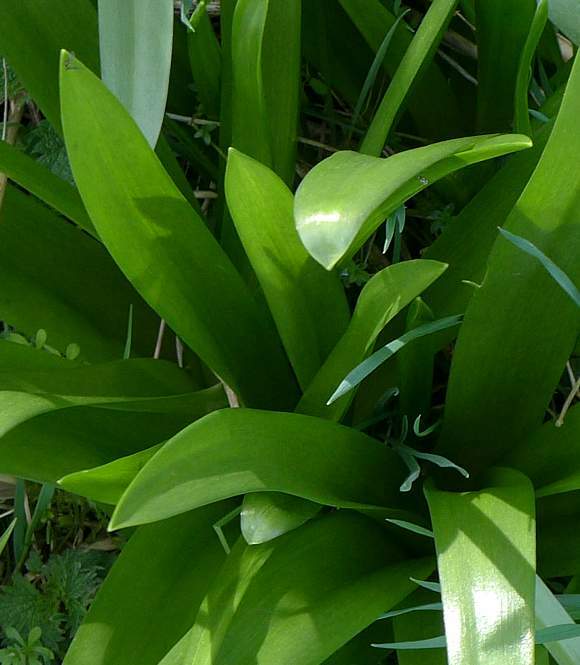 However, this particular Scilla species has not been much studied for secondary metabolites. 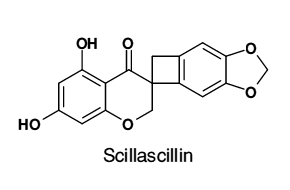 The Scillascillen-type of Homo-Iso-Flavonoids are very unusual compounds for plants, containing a cyclo-butane ring (the square). The cyclo-butane ring is joined at a single point making these compounds spiro compounds (meaning they have a twist at that point, not that they can continually revolve). 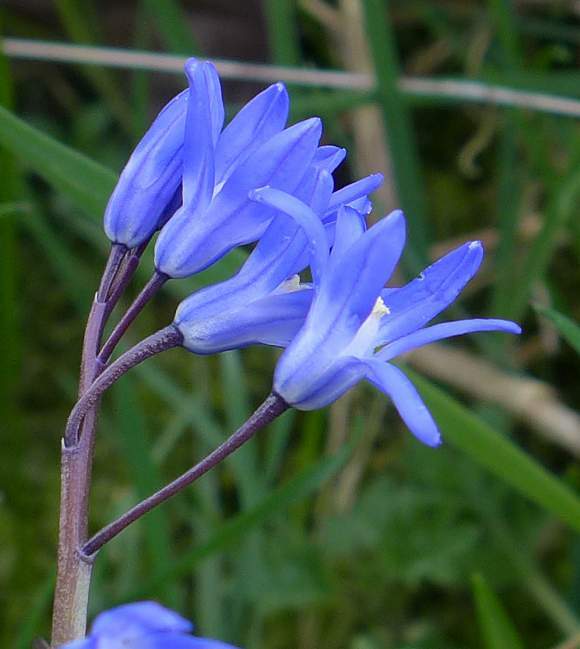 Many species of Scilla and other genera belonging to the same family (Asparagaceae) contain a great variety of slightly differing compounds with this 6,6,4,6,5-ringed skeleton. So many that your Author has not bothered to draw others and urges his readers to use their imagination.